The fourth annual Hemel en Aarde Winegrowers Pinot Noir Celebration has just been concluded, the fundamental point of debate being whether or not the creation of the three wine wards of Hemel-en-Aarde Valley, Upper Hemel-en-Aarde Valley and Hemel-en-Aarde Ridge corresponded to discernible differences in the respective wines. Underlying all of this, the notion of terroir – wines made from the same variety supposedly tasting different depending on where they are grown, some sites capable of more profound iterations of the variety than others and therefore such wines capable of demanding a higher price in the market. It struck me, yet again, how tenuous terroir is. For it to be valid, then we have to think of a wine as serving to communicate between site and drinker. Here, the impact of site is all, the implication being that people will ultimately have the same perception of a wine’s quality regardless of the time and place of its consumption. As we all know, however, the same wine is often perceived differently by different individuals or even by the same individual under different circumstances. The point is that it is ultimately impossible to discern the primacy of site because 1) viticulture and winemaking necessarily obscure it and 2) too much of how a wine is perceived is decided by what the drinker brings to the task of assessing it. Terroir is meant to function as the absolute determinant of quality but our understanding and appreciation of any particular wine is always going to be relative. All that said, three wards rather than one certainly adds mystique to the area’s Pinot Noir initiative and an annual celebration just adds fuel to the fire – very canny marketing by all those involved. At this point, defenders of terroir (and there are many) will no doubt be energetically composing their counter-arguments. That wines made from the same variety will taste different depending on where they are grown, is entirely self-evident. After all, this is a principle that applies throughout agriculture: Charolais beef from France will be different to Kobe beef from Japan, for instance, and as to which is better, is a moot point. Neither is it preposterous to suggest that when it comes to achieving the most distinctive and refined expression of a particular variety, not all sites will be equally suitable. But what of two wines of the same variety from an equally celebrated region? 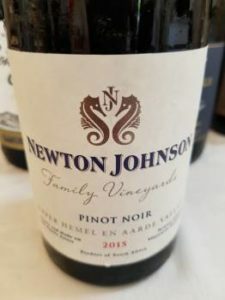 It seems to me that when it comes to the Hemel-en-Aarde, there are individuals who simply have a greater intuitive sense than their counterparts regarding how best to express Pinot Noir. It is, of course, a pretty neat party trick to be able to discern a wine as being from the Côte de Nuits rather than Côte de Beaune, from one Grand Cru rather than another and then from one specific producer rather than another but this, I think, is a not inconsiderable feat of memory that the well-heeled or at least well-connected get to perform after they’ve drunk that particular cuvée over many vintages. Here “beautiful” for me is simply that complexity should be rewarded over simplicity and harmony over discordance – site matters to the extent that you need a place to grow the grapes physically but suggesting that the ultimate measure of a wine is how accurately it expresses that place of origin is nonsensical.